Your favourite social network is a bit like a romantic partner: when things are good you want to share everything, but when things go bad you're asking for your DVDs back, haggling over who owns what and wishing you'd never told them anything. How do you get your stuff back when your chosen network doesn't seem so special any more? Services such as Facebook do their very best to get you to share everything: your photos, your calendar, your address book and so on. Usually it's a win/win situation - it makes your life easier and keeps you on the site, looking at the ads - but not all relationships last. Facebook's endless tinkering with privacy protection and its terms and conditions might send you packing, or your friends may dump your current network and sign up somewhere else, or you might decide you'd rather keep your photos on Windows Live rather than Flickr. So how do you get your stuff back? The answer depends on what your stuff is and where it's stored. Here are five top tools and tricks. Flickr is a brilliant service, but getting your photos out is much harder than getting your photos in. The good news is that Flickr publishes an API that enables third-party developers to write Flickr-friendly software, and that means you can get your hands on bulk download program Bulkr. Bulkr is free, and it's written in Adobe AIR so it runs on Windows, OS X and Linux machines. You can set it to download batches of up to 500 photos at a time, and if you give it your username and password it'll download private photos as well as public ones. There are a few omissions - for example, if you want to download images' associated EXIF data you'll need to buy the $24.95 Bulkr Pro - but it's a great little application that recently saved our bacon following a hard disk crash. The idea that anyone might ever want to leave Facebook simply doesn't cross the social network's Machiavellian little mind, so as you might expect Facebook's photo features are all about uploading and sharing, not downloading and saying sayonara. Enter the Facebook Photo Album Downloader, or FacePAD for short. FacePAD is a simple and effective Firefox extension: install it, head for the Photos tab in Facebook - yours or somebody else's - and right-click on the album name. Select Download Album with FacePAD and the photos will instantly appear on your desktop. You don't get original filenames, comments or other metadata, but you do get a very speedy download. There's a version for MySpace too - MySpacePAD - but developer Arthur Sabintsev isn't supporting it any more: he notes that the site is getting a software upgrade soon that will render his application useless. Credit where credit's due here: Microsoft takes the attitude that your photos are your property, so it makes it nice and easy to get them back out again. Simply login to Windows Live, click on Photos, open an album and then click on the More drop-down. Click on Download as Zip file, and the album downloads. If you're using a Mac you'll need to add the file extensions yourself: our Mac thought the files were Unix Executables. Facebook actually makes it easy to export your Events to other applications: if you click on your Events tab in the Facebook website you'll see a little Export Events link. This gives you a choice: it tells you how to export individual events one at a time, and it gives you a URL to click if you want to export everything. Events are exported as .ics calendar files, which play happily with Outlook, iCal and Google Calendar. It turns out that the best way to export your Facebook contacts list is to sign up with Yahoo. 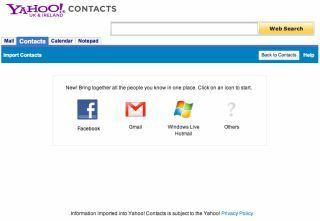 Its address.yahoo.com site can import contacts from all over the place - Facebook, MSN, AOL, desktop programs and even Google's Orkut network - and more importantly, once you've transferred the contacts you can take them out again. To get started simply visit address.yahoo.com and either login or sign up for a free account; click on the Import Now link and choose the service you'd like to import your contacts from. Once you've given Yahoo permission to access your account it'll grab the data; when it's finished you can click on Tools > Export and choose from Outlook, Thunderbird, CSV or vCard format.